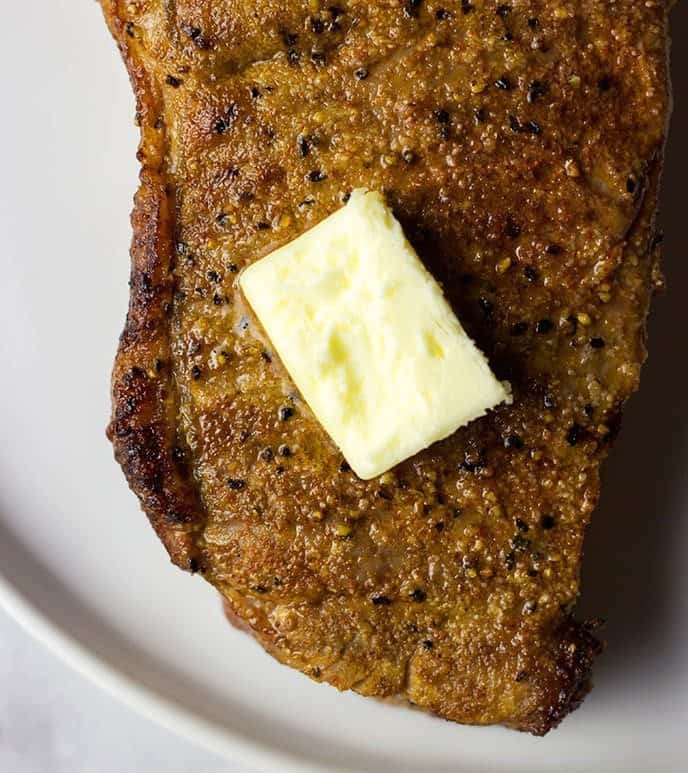 Here’s a great air fryer steak recipe with simple ingredients to make this delicious steak ready in under 15 minutes. When I think of steak, charcoal and grill come to mind. However, during cold season or when you don’t feel like firing up the grill, an air fryer is a fantastic way of cooking a steak. If you’ve followed my recipes, you know that I love using air fryers to cook quick meals. My air fryer chicken recipes is a regular dish in my household, especially during gameday weekends. My air fryer steak recipe is a perfect dish for busy nights. Let me show you how easy it is. 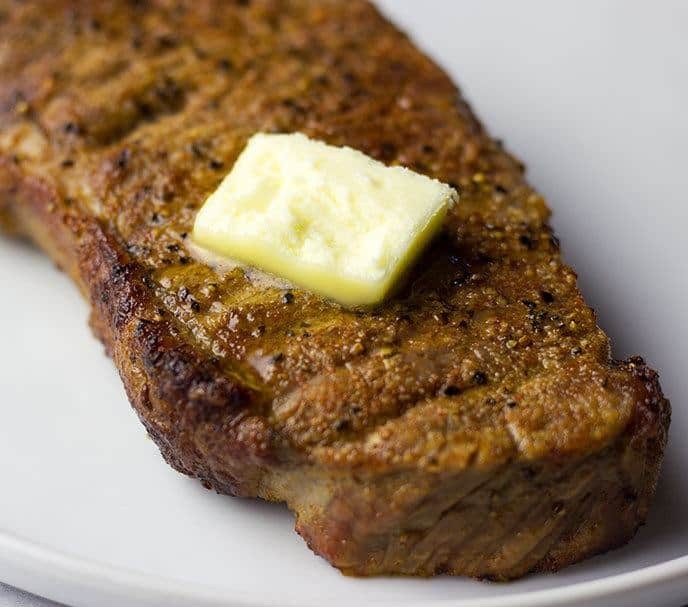 A perfect steak starts with the right meat. Go for steak cuts with extra fat and marbling. It will taste much better than leaner cuts of beef. The level of doneness will make or break a steak. Don’t ever cook a steak to well done. Unless of course, you like eating dry and tough meat. Any more than medium doneness will come out tough. When it comes to flavor, I like it simple. As you’ll see my recipe below, I use simple ingredients to flavor my steak. You don’t need exotic ingredients to cook a perfect steak. I normally have ribeye steaks, but today I’ll be using a New York strip steak. It is what I have in the freezer. If your meat is frozen. Let it come up to room temperature before air frying. The heat penetrates much easier when the meat is not frozen. When cooking steak in the air fryer. Flip the steak halway through for even cooking. Chef Tip: Use a quick read thermometer to check the internal temperature of the meat. It is the safest way to know that the steak is cooked to your desired doneness. This is optional but you can rub or spray olive oil on the steak. It helps crust the outside of the meat and adds extra flavor. I did spray olive oil for this recipe. Now take a look at that deliciousness…mmmmm! Allow meat to sit at room temperature. Spray olive oil on both sides of the steak. Season meat with kosher salt, black pepper, garlic powder, and paprika. Place steak in the air fryer and cook for 12 minutes. Flip halfway through. This comes out to medium doneness. Let the steak rest for 5-10 minutes before cutting. This recipe worked perfect in my air fryer. I also used NY Strip steaks. Looked good, smell good, tasted good. Fast & Easy way cook with very little cleanup. Thanks for posting this! And thanks for your service. Trying out my new Cooks Essential 5.4 air fryer from QVC.. Followed this recipe for thick NY Strip steaks exactly as recommended for preparation. Pre-set timer on my unit for steaks was for 9 min at 400. Husband likes his steak very well done, So, I flipped at 9 min and ran it at 400 degrees for 5 more min. Both were VERY well done, but still juicy and DELICIOUS. Since I like mine rare, I think I will flip both at 5 minutes next time and take mine out at 9 min., letting his go on to 12. I used dried herbs in the unsalted butter that I topped them with, as they rested for 5 min. right after frying. I figure my unit is bigger and may cook faster enough that timing will be different. Will check with thermometer. We may never grill steaks again on our electric George Foreman grill which leaves a little to be desired. We live in an apartment where outdoor BBQ units must be electric.} Might also add that, although I haven’t bought beef at Walmart since I had a roast I could NEVER get done or tender years ago. But, it was -15 degree wind child and I did not want to go to another store and thought I would just grab two steaks and give it a try. Again, THEY were DELICIOUS! Thank you so much for this recipe. The steak was amazing! Thank you so much for the recipe… it was very simple to use and the stake turned out absolutely perfect!